Today like many of you fellow Bromptoneers I attended the Launch Event of the Brompton World Championships. Last night I had made last minute preparations by pumping up the tyres and applying a thin coat of oil to the chain. I was excited! So excited that I bought a pair of those shorts with a gel pack that I think make ones posterior end look like a baboons bottom on a David Attenborough programme. I wore a pair of cargo shorts over the top of them. I mean, I couldn't be seen so close to home wearing, them! 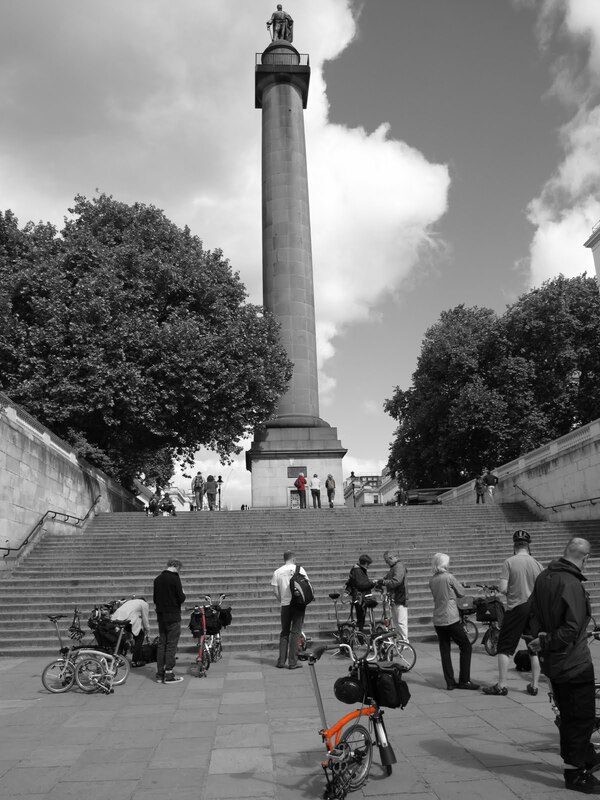 This morning I made the short cycle ride from my house to the steps in front of the Duke of York memorial, leading to The Mall. There were only a few of us there initially but there was an aroma of anticipation. We registered and were all given yellow wrist bands not that dissimilar to those given out during my clubbing days. We waited. We caused quite a stir with tourists, who didn't know what to make of it all? I saw 'Cycling in heels' whom I recognised by her feet. I wasn't brave enough to go over and say hello or that I was, 'My Orange Brompton' sadly. Maybe next time. With near military precision we were given our marching orders and then we crossed The Mall and headed towards Buckingham Palace. The general feeling of loveliness of cycling on-masse with over 100 Brompton riders cannot be underestimated. Brompton staff did an excellent job of marshalling the entire route which made the whole experience a relaxing amble through London. We moved to Brompton Cemetery for a short break and to allow those straggling at the back to catch up with the front of the pack and then over Putney Bridge. As we rode adjacent to the Thames we saw all number of rowers either on the water or getting ready to do so. As we rode past we saw lots of cyclists either on Boris Bikes or their own. I felt sorry for them as they weren't part of the club. They weren't part of the fun. Dare I say it, they seemed a little dull by comparison? The sheer number of colours and colour combinations of Brompton Bikes and their riders amazed even me. I thought that this pink lady was very well colour coordinated. I could be wrong but I think she even had a matching iPhone cover? Eventually we arrive at the sight of almost pilgrimage and more importantly the smell of freshly cooked food and the sound of very good live music! The food was excellent. I had bean rice, jerk chicken and a rather tasty curry. The shrine for all Bromptoneers! I was worried about parking my bike as I had brought my lock but forgot the key! I didn't have to worry as a number was stuck to the bike and I was then given the same ticket number to look after. The amount of bikes in the parking area must have been worth thousands but I was more impressed by the colours. Don't they look great! What colour are you? Can you spot my Brompton?? Food eaten, we chewed the fat for a while before being allowed in to the factory itself. The staff were very friendly and enthusiastic and only too happy to tell Brompton Geeks about how their bikes were made. I had a great day! The bikes were good. The company even better and Brompton knows how to organise a great day. 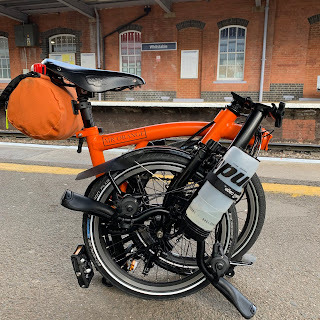 I left feeling even more enthusiastic about Brompton Bikes and wanted another. Perhaps that is sort of the idea? Either way many thanks to Brompton and all the staff who helped out today. It was much appreciated. Going to have to start training for the BWC in August!